Take your E90 to the next level with this sport shock and spring package. These H&R springs and Bilstein shocks are one step beyond the factory sport suspension - giving less bodyroll and better balance through the corners. The stock suspension does a good job of pleasing everyone but it can be improved to be more capable when the road turns twisty. This E90 suspension package is an excellent blend of improved handling and ride comfort. H&R Sport springs lower the ride height as much as 1.3" in front and 1.2" in the back and stiffens the spring rate. Both combine to lower the car's center of gravity and reduce the amount of bodyroll in corners. The springs are progressive rate so their initial stiffness is actually very compliant and it becomes stiffer as the spring is compressed. This is great for street cars that see bumps and potholes where suspension compliance is key. Overall, they are about 30% stiffer than the stock original springs. Lowering amount will be less if replacing the factory sport suspension. 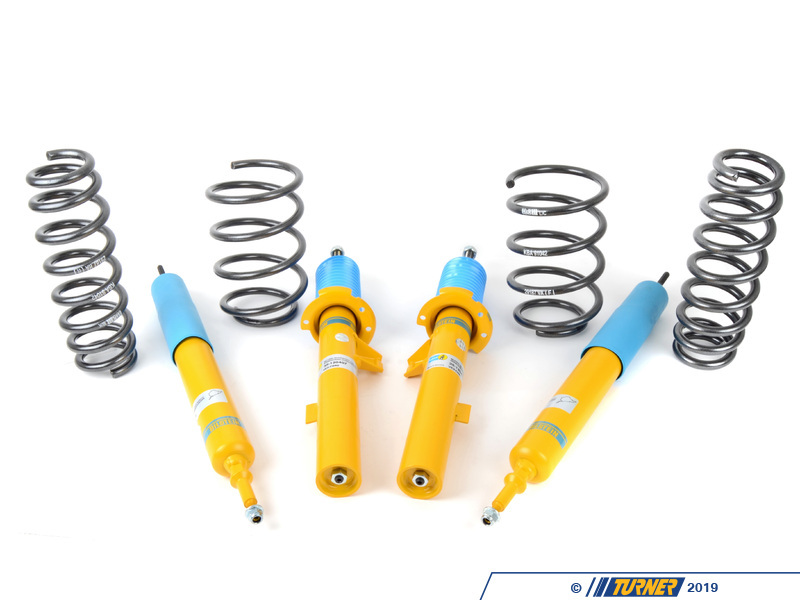 We use Bilstein shocks as the dampers and they feature Bilstein's patented and innovative valving system. With this system, small bumps and impacts are absorbed as they should be. But the shocks stiffen for cornering and other suspension motions. It's the best of both worlds as the shock self-adjusts based on suspension motion. These fit with the stock strut and shock mounts, making for an easy and clean install.